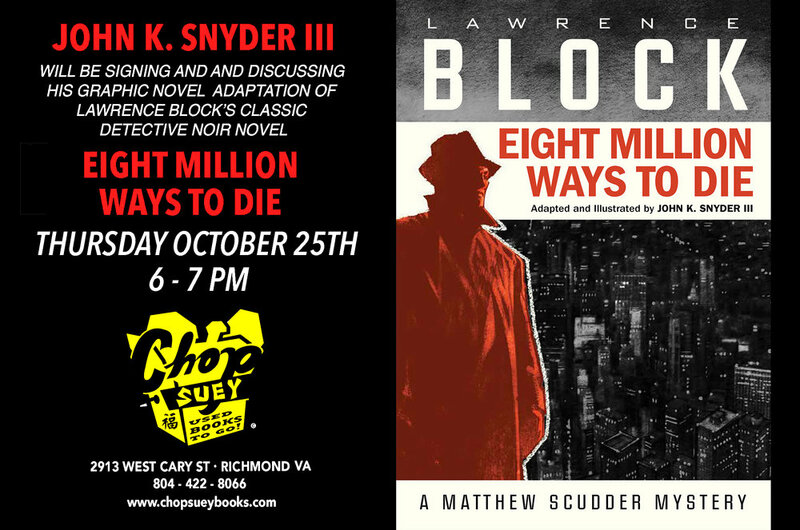 Join us for a book discussion and signing with artist John K. Snyder III, adapter and illustrator of the graphic novel adaptation of Lawrence Block's detective noir classic novel Eight Million Ways to Die. Free & open to the public. About the adapter/artist: John K. Snyder III is an Eisner-nominated artist whose career spans over three decades and is the creator of the groundbreaking alternative comic series FASHION IN ACTION. Snyder's previous literary adaptations include DR. JEKYLL AND MR. HYDE and Joseph Conrad's THE SECRET AGENT. He is also known for his work on DOCTOR MID-NITE and SUICIDE SQUAD for DC Comics. About the book: In crime-ravaged 1980s New York, troubled ex-cop turned unlicensed detective Matthew Scudder takes on his most dangerous case, hunting down a serial killer-hitman, and ultimately coming face-to-face with his deadliest enemy, himself.